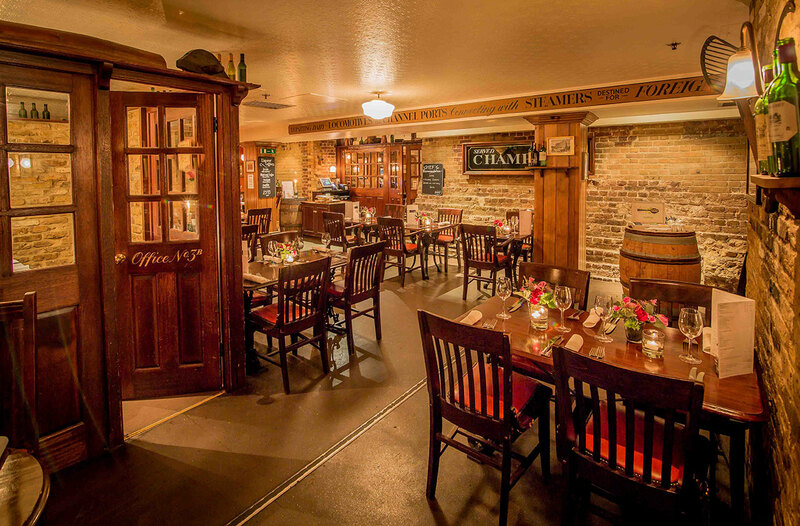 Champagne Charlie’s, in London, England, is a lovely atmospheric and cosy cellar style bar. 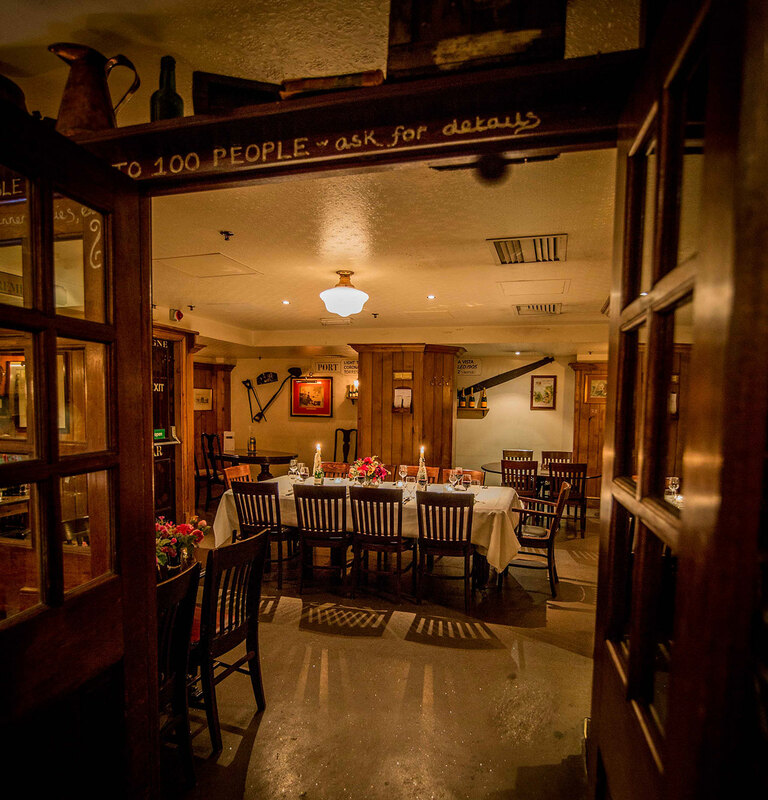 It is part of the Davy’s group, offering wine by the glass, carafe or bottle on the ground floor. There is a wide variety of gins and whiskies too. The lovely restaurant with a wide menu is down stairs. It is a bit of a tardis and seems to go on for ever. The venue has easy access to many parts of London by tube, train and bus. It is near both Embankment and Charing Cross underground stations and a nine minute stroll from Waterloo across the Jubilee Bridge, tucked away at the Arches. It is unique amongst the dozens of eateries in the area. The exposed brick walls with no windows in the restaurant, as you are underground, does create an interesting atmosphere. However, it is not claustrophic. The clever use of aches and mirrors avoids that. My daughter recommended this to the family. She and her husband use it when dining with friends. The staff were polite and helpful. I am vegetarian and there were various choices available to me as well as to the omnivore members of our group. The pub area of the venue was busy and quite noisy, but we were there on a Friday evening. I would have been surprised if it had been otherwise. It is possible to reserve a table and my daughter had booked a table for our meal. The restaurant was not nearly as busy, or as noisy as the pub. We had a delicious meal in lovely surroundings. Two of us had the risotto, which is delicious and the other had the burger: this is her firm favourite. We each had a gin and tonic, but apart from that, stuck to soft drinks. I had planned to have cheese and crackers afterwards. The menu boasts a wide variety of cheeses and the crackers are picked to match them. This all sounded marvelous, but there was no way that I could have eaten that much. I was too full of risotto! I ordered a brownie, because I am a chocoholic and could not resist. It was absolutely lovely, but, even sharing it with my younger daughter, we could not finish it. The portions are generous. We finished our meals with a cappuccino and two Earl Grey teas. It was a terrific meal and the price was very competitive for central London too. It was good value. The only real negative I found was that , if you are disabled or have mobility issues, access is difficult. Champagne Charlie’s is tucked away under the arches beneath Charing Cross station this is an unusual place full of character. I certainly enjoyed my meal and my evening and would recommend Champagne Charlie’s. I plan to visit it again. I’m glad you enjoyed it but would have liked to see more information about the actual food – usually a key part of a restaurant review 🙂 Style of cuisine? Dishes eaten/recommended? Prices vs. value? Thank you for your comments. I have revised the review in light of them. I appreciate the feedback.